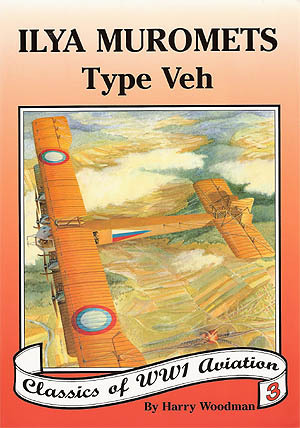 Written and illustrated by acknowledged expert Harry Woodman, who has probably done more research on these enigmatic aircraft than anyone else , this 48 page book provides over 50 rare photos, eight pages of exact 1:48 and 1:72 scale plans by the author, sketches, tables, colour notes and four colour profiles.Outside of Russia, this is the best source of documentation for these four-engined behemoths ever published. Last copy of our May/June 1990 edition with its scratchbuilt Albatros,Sikorsky Veh data,Glencoe OEF D.III build log,Nieuport 27 colours,Meikraft Pfalz D.III kit review build and stacks of reviews! Worn but complete-one only.